HMS Buffalo was originally named the Hindostan. It was built of teak in Calcutta, India in 1813. Its builders, James Bonner and James Horsburgh, sailed the Hindostan and a second vessel to London and sold them to the Admiralty to be used as storeships for the Navy. The Buffalo’s early history did not promise a grand beginning for the province of South Australia. It made four voyages for the Navy but was laid up at the end of the Napoleonic Wars in 1815. The Navy considered selling the Buffalo but the ship was saved when an outbreak of cholera reached Britain. It was used as a quarantine ship. The Buffalo was then despatched on three voyages to New Zealand to obtain kauri timber for spars. On the first of those voyages, it also delivered convict women to Sydney. On the second, it would take Governor Hindmarsh to South Australia. The 589-ton Buffalo was the largest of the first nine ships. 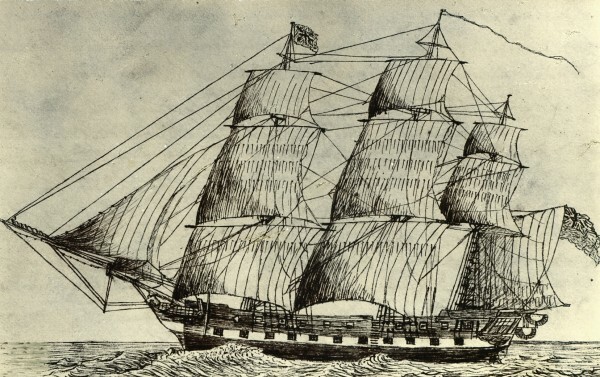 It was 36.6 metres long and 10.3 metres in beam and it carried 174 passengers – twice the number of any of the other nine ships that reached South Australia in 1836. Hindmarsh was appointed captain of the ship. Amongst the 37 cabin and intermediate passengers were his family and his private secretary, Stevenson, and government officials such as Resident Commissioner Fisher, Colonial Treasurer Gilles, and Colonial Chaplain Howard. As well as 137 emigrants, the ship carried 85 officers and crew, and 19 marines. The Buffalo had two fixed decks. At the front of the ship it had a forecastle deck sheltering the galley stoves, which stood on the uppermost deck, and at the back it had a poop deck over the passengers’ cabins. In the between-decks additional cabins were installed for the ship’s officers and intermediate passengers, while emigrants, who were given a free passage, shared a dormitory. The crew slept on the orlop, an additional deck installed in the hold. My great great great great grandfather is Robert Walker, him and his wife Sophia Bessell came over on the HMS Buffalo and gave birth on the voyage to South Australia, Henry (Walker) Owen. There is a great book called They Came with the Buffalo- a saga of Port Lincoln written by Doreen K. Puckridge, the grand daughter of Henry. Has great insight into the conditions and the hardships they came across back in the early pioneer years. Thanks for that Kyran. If you have any additional information as we get to the Buffalo voyage in July we would be very interested. to source the book (THEY CAME WITH THE BUFFALO) .